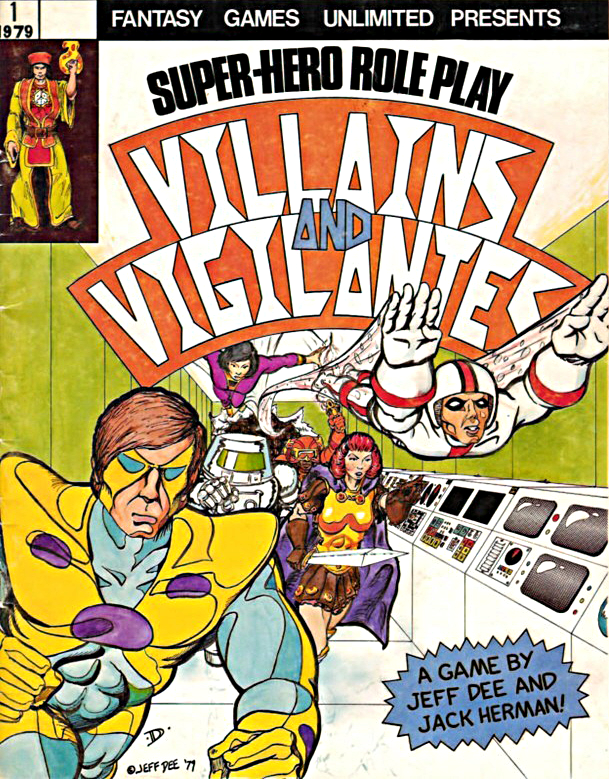 After a 20-month legal battle, the creators of the super-hero roleplaying game Villains & Vigilantes have prevailed in their court fight with the game's longtime publisher. Magistrate Judge Mark E. Aspey of the U.S. District Court for Arizona ruled on January 15 that Jeff Dee and Jack Herman own the rights to the game based on the 1979 contract they reached with publisher Scott Bizar of Fantasy Games Unlimited. The court also found that Bizar never had the right to sell derivative products or ebook PDF editions of the game, two things he has been actively doing in recent years. 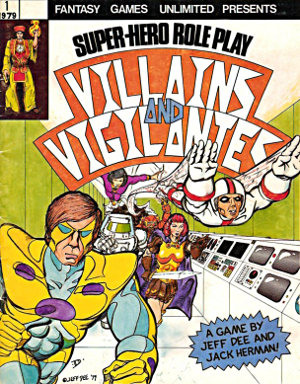 Villains & Vigilantes, one of the first super-hero roleplaying games, was created by Dee and Herman when they were teens in 1979. Bizar published the game and a subsequent 1982 edition and it was commercially successful, selling thousands of copies during a tabletop gaming boom sparked by the popularity of Dungeons & Dragons. But in 1987, Fantasy Games Unlimited curtailed most of its business activities after encountering difficulties with distributors. Bizar became a high school teacher and ran a game store in Gilbert, Ariz., selling the games by mail order and online for part of the last two decades. The store closed in 2007. Bizar shut down Fantasy Games Unlimited as a New York corporation in 1991 and founded a sole proprietorship of the same name in Arizona that continues to market games he published in the '70s and '80s. In 2010, Dee and Herman started Monkey House Games, LLC and published a new edition of the game. Dee told Ain't It Cool News that they had never been informed by Bizar that Fantasy Games Unlimited, Inc. was dissolved as a corporation, which under the terms of their publishing contract should give them all rights to the game. "[T]he contract clearly stated that if FGU, Inc., ever ceased to exist, then the publication rights reverted back to us," Dee told the site. Judge Aspey did not rule on that argument, but instead found that the 1979 contract between Bizar, Dee and Herman only gave Bizar the right to publish the 1979 and 1982 editions of the game in printed form. "Because Defendants Dee and Herman hold the copyright to the characters and setting, Defendants presumably may create and market derivative works and obtain the financial benefits therefrom," the ruling states. "Additionally, because the marketing rights to the game do not appear to have been transferred, defendants hold the right to produce and sell or license such items as clothing, video games, card games, and movies or television programs." Both parties in the lawsuit attempted to register Villains & Vigilantes as a trademark in 2010, prompting a Trademark Trial and Appeal Board case that was put on hold until the suit was decided. Judge Aspey ruled that because Bizar did not sell any copies of Villains & Vigilantes from 1990 to 1994 and 1999 to 2004, he lost any rights he might have had to the trademark. "The court therefore concludes that any right to the trademark 'Villains & Vigilantes' was abandoned by plaintiff at least when he ceased to use the mark from 1999 to 2004," he states. The ruling calls Bizar the plaintiff and Dee and Herman the defendants because he sued them in Arizona and two other suits were consolidated with that one. Judge Aspey concludes, "[O]ther than possessing a license to produce and market the printed book forms of the 1979 and 1982 Works, Plaintiff has no right to the copyrighted works of Defendants. Specifically, Plaintiff was not licensed to produce or market a PDF form of the 1982 Work or to produce or market such items as comic books, apparel, or other merchandise utilizing copyrighted elements of the Villains and Vigilantes role-playing game created by Defendants." Bizar is currently selling PDF editions of the game and over 40 supplements through the Fantasy Games Unlimited website and RPG ebook retailers. He's also selling some of those products in print editions on his site. Bizar's attorney Sterling R. Threet appealed the decision Feb. 19 with the U.S. Court of Appeals for the Ninth Circuit. With the judgment, Monkey House Games appears likely to be granted its registered trademark and can continue to sell printed and electronic editions of Villains & Vigilantes and related products. Unless he wins the appeal, Bizar cannot sell anything but printed copies of the original 1979 and 1982 editions of the game. The case could have an impact on Bizar's other games. All of them originally were released in the late '70s and early '80s, long before electronic publishing rights were anticipated by most publishers. In the 2002 case Random House vs. Rosetta Books, the New York state court of appeals ruled that unless a publishing contract explicitly grants ebook rights to the publisher, those rights are retained by the author. Even a contract that gives a publisher rights "in book form" would not be interpreted to cover ebooks. The court ruled, "[T]he law of New York, which determines the scope of Random House's contracts, has arguably adopted a restrictive view of the kinds of 'new uses' to which an exclusive license may apply when the contracting parties do not expressly provide for coverage of such future forms." Another thing working in Dee and Herman's favor is a provision of copyright law that enables authors to cancel publishing contracts they entered into 35 years earlier. In 2014, authors can employ these termination rights for works published in 1979. Congratulations to Jeff and Jack! May they create and craft even better things! p.s. Thank you for being so diligent on this and sharing the court decision as well. VERY enlightening! Thank you for the the great write up the verdict and the overall saga. So if I understand this...they only EVER had the rights to publish the game itself?? Not any of the modules, ever?? wow...that could be a real issue! So it's not about having the RIGHTS to publish, it's about doing it until the lawsuits start flying -- and also act like you still have the rights, even when you don't. Where's a superhero when you need one? Having looked at the judgement (thanks), I don't know what royalty rate they were on, but apart from that, they had a much better contract than a book publisher would have offered them. Yea! Someone is going to make literally 100s of dollars.